During their colorful lifespan, Tottenham Hotspur were mostly known as cup specialists. They made history by becoming the first British team to win a European trophy, as well as winning the first UEFA Cup ever organized. Overall, their trophy room contains eight FA Cups, four League Cups, one Cup Winners' Cup and two UEFA Cups. In addition to their long tradition of cup success, the "Spurs" can also boast with two League titles in 1951 and 1961. 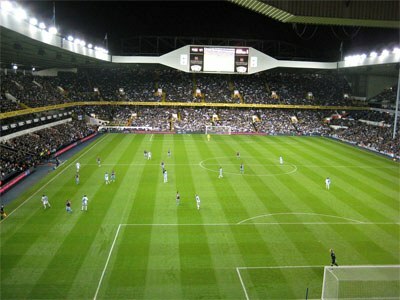 White Hart Lane, homeground for Tottenham since 1899. Tottenham Hotspur FC was founded in 1882, by a group of grammar-school boys from All Hallows Church. At first, the club was simply named Hotspur; in order to avoid confusion with an older club named Hotspur FC, the name was soon changed to Tottenham Hotspur. Shortly after being admitted to the Southern League in 1895, Tottenham started attracting large crowds to their home games; this surge in popularity played a big part in the club becoming a trophy contender. They acquired their first piece of silverware in 1901 by defeating Sheffield United in the FA Cup final, thus becoming the only non-Football League side to win the FA Cup. In 1908 the club became a member of the Football League and would already in the first season managed to get promoted from the second division to the first. Save for a single FA Cup in 1921, the next five decades were fairly uneventful for the club. The post-WWII period saw them perk up a bit, especially after they started implementing the "push and run" style of play. While one of the biggest reasons Tottenham won a League title in 1951, this strategy did not prove particularly effective once the opposing teams had started adapting to it. The appointment of club legend Bill Nicholson as manager in 1958 was the dawn of a new era for the club. Nicholson's time with the club is widely recognized as the greatest period in Tottenham's history; during his sixteen years at the helm, he led the club to a League title (1961), three FA Cups (1961, 1962, 1967), two League Cups (1971, 1973), one Cup Winners' Cup (1963) and the inaugural UEFA Cup (1972). Nicholson's departure in 1974 left an immediate impact on the club, which was relegated not long afterwards. Their troubles would not last too long, however; with a new manager, Keith Burkinshaw, and a couple of star signings, Tottenham returned to the spotlight by claiming an FA Cup in 1981. After defending the trophy the following year, they went one step further by winning their second UEFA Cup in 1983, outlasting Anderlecht in the final's penalty shootout. In 1978, two members of the 1978 World Cup winning Argentina squad, Ricky Villa and Osvaldo Ardiles were transferred to Spurs. This was big news not only because of the quality of the players, but also since it marked the end of a ban that had been in practice for almost 50 years in English football concerning foreign players. Ardiles would play ten years for the club and Villa five years, both became very popular among the fans. The next couple of decades were decidedly mixed, with three successful Cup forays standing out in a sea of mediocre league finishes. After claiming their final FA Cup in 1990, Tottenham followed it up with League Cup victories in 1999 and 2008. Since 2001, Tottenham Hotspur FC is owned by the investment company ENIC Group. The characteristic rooster have always been in Tottenham Hotspur’s logo. When the logo was redesign in 1956, more elements were added to it, but the current logo that was adopted in 2006 restored the simplistic design approach and is quite similar to the original logo.